Developing assertiveness is a journey. Take the first steps with WiseAmigo and discover how we make the journey easier than ever before. Joanna is three months into her role as a Brand Assistant. But finds it difficult to assert herself in meetings. She wants some ideas on how she can start speaking up and contributing in groups. Joanna creates a spotlight called ‘Assertiveness’. She’s clear on the mission – to be more confident in speaking up in meetings. She puts a timescale of three months to start off. Open up the Spotlight tab and click + to begin. Start typing or find inspiration from popular Spotlights. Remember, Spotlights can be reviewed over time. So don’t overthink it. Inside her Spotlight, Joanna looks for a little help on what being assertive is all about. So she explores the recommended Elements. 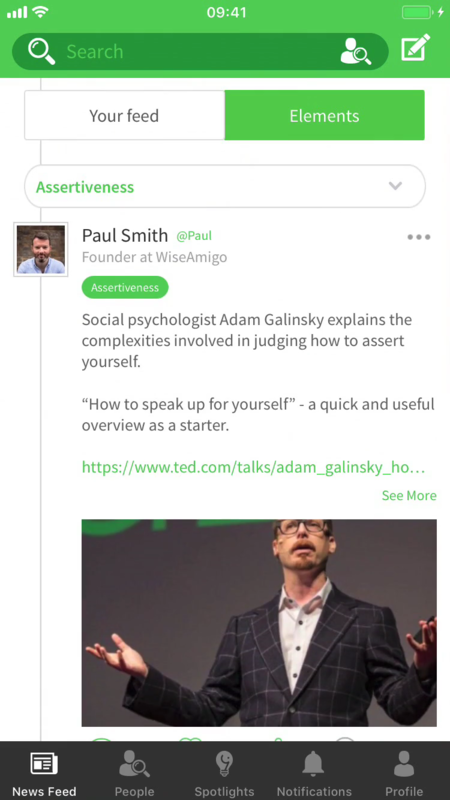 As well as Assertiveness, WiseAmigo offers Joanna two related elements, Communicating and Building Relationships. In seconds, she has an idea of what good looks like. Once inside your Spotlight, Elements can be found on your overview screen. So now it’s time for Joanna to take action! Unsure of where to start, she browses the Action inspiration list. She finds some ideal actions and objectives to get her teeth into. By speaking and asserting herself earlier in meetings, Joanna can start contributing faster. And feel more confident. With a specific project meeting in a couple of days, she adds the date and gives it a high priority, before saving it to her list. Taking action is vital to true self-development. 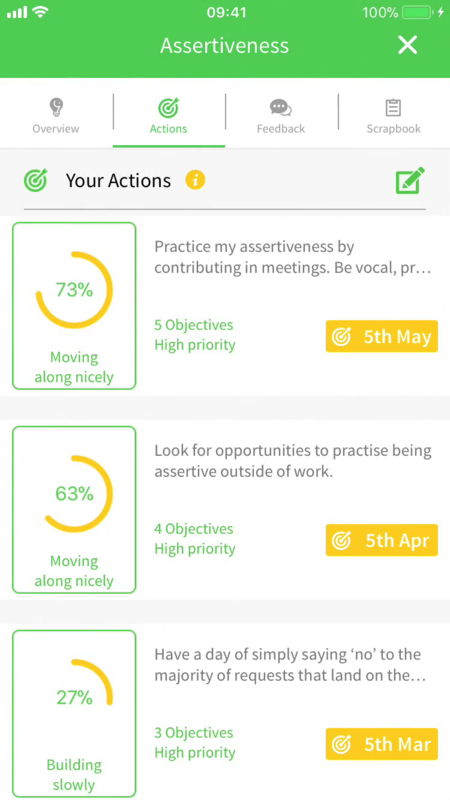 With WiseAmigo, you can easily set up Actions and tick off Objectives as you go. Start from scratch, or draw on our bank of tailored activities to get cracking. Build up your Actions and see progress. The more you do, the more you grow! On the day of the meeting, Joanna’s keen to assert herself and has a flick through one final article to help get ready. With her 10-second ‘elevator pitch’ well versed, she feels more confident in asserting exactly what she does. And it’s off to the meeting. Browse the Elements to find fresh insights to help you develop. Posts are categorised so you’ll find what you need, faster. Follow others to build your feed. After the meeting, Joanna reflects on how it went. She’s happy that she quickly introduced herself and said what she does. She’d also stated some aims. Joanna felt good. Her confidence grew. As the meeting progressed, she got more involved. She asked questions. She shared her views. 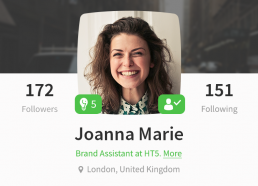 With a confident start, Joanna is growing with WiseAmigo. Track your progress and reflect on your actions. Capture your learning and build a portfolio of development over time. Showcase your evidence and get where you want to be, faster. Get started on your developmental journey with WiseAmigo. Whether you want to build assertiveness like Joanna, or strengthen your skills elsewhere, WiseAmigo is both a portal to the world of development and your supportive friend.